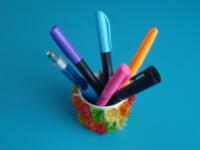 Use gummy bears to create an adorable pencil holder. 1. Gather your material. 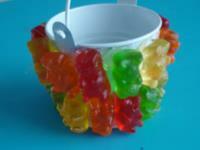 You will need several gummy bears, a container (empty yogurt container, miniature bucket, metal can, etc. ), as well as white and/or hot glue. 2. 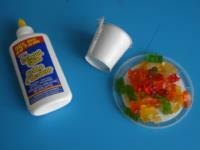 Show children how to glue rows of gummy bears on the container. This seems easy, but it is a true test of fine motor skills for little hands! Name the color of each gummy bear. If you wish, you may ask children to follow a specific pattern. For example, I used the following pattern: one upside down bear, one upright bear, one upside down bear, one upright bear, etc. 3. The gummy bears will harden over time. 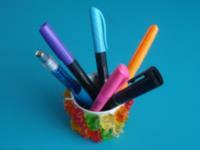 The container can be used as a pencil holder or for storing arts & crafts material. You could even plant a flower seed or a bean seed in it to celebrate bears and spring with this simple craft!